The complex is designed especially for nature lovers and guests who want to relax in a peaceful surrounding. It consists of 22 comfortable wooden cabanas on stilts now, scattered around a secluded beachside palm-grove, considerably separated from each other. 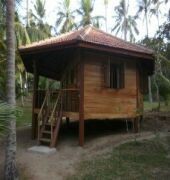 The cabanas are kept rather basic using local materials, but each is equipped with an attached bathroom with hot water, electricity, fan, tables, chairs, comfortable beds, beachmats, lielows, spacious Thai mosquito nets and a veranda facing the sea. Food and drinks are served in an octagonal, open and therefore cool restaurant-bar. Meals and drinks are generally Sri Lankan style, slightly modified for foreign tongues. A wide selection of local and international wines, delicious caribbean cocktails and a choice of beers and fresh fruitjuices are offered.